Date: Saturday, 17 Aug 2013. Location: SAFRA Jurong, Evergreen Room. Admission is FREE. No pre-registration required. Weather permitting, there will be a live stargazing session at SAFRA Jurong's multi-purpose outdoor court! You will then be able to look some of the best privately-owned telescopes in Singapore. Observe the rings of Saturn, colourful double stars and Moon's craters, valleys and mountains live! You may even take beautiful Moon photos with just your mobile phone handheld over the telescope! By Car: Drive along Boon Lay Way, turn left into the SAFRA main entrance and then into the underground car park. Parking fees per session from 6pm onwards: $1.66 (SAFRA members), $3.45 (non members). From 6:00pm onward. - Free car-parking right at the observation site and power supply for telescope volunteers. The cash-card deduction at entrance will be reimbursed on that night. - Telescope volunteers who are keen to participate, please PM or email me at gary[at]astro.sg. 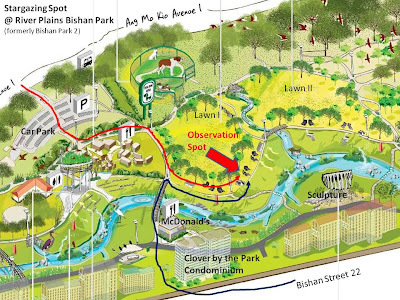 - Carpark is just below the observation spot. Just take a lift up. Easy to transport big telescopes with a trolley. - We can stay there at least up to 3:00am the next morning. So bring your family and friends along and have fun-filled starry evening! The most spectacular and highly anticipated meteor shower of 2013 is here! Q1: What's so special about his particular meteor shower? Moon sets very early during this period. A moonless night is darker and allows more meteors to be seen. Especially the dimmer ones. Perseid Meteor Shower statistically has the highest chance of seeing fireballs - very bright meteors that can be even brighter than Jupiter or Venus! And it is happening on a super long weekend when people can stay up late overnight! Q2: When is the best time to observe it? During the predicted peak period on early Tuesday morning from 00:15am till 00:45am. BUT you do not have to wait until then. Meteors can be seen a few days before and after the peak period at a slightly lower rate per hour. And due to unpredictable skies, it may not be clear on the actual peak night! So start hunting every night from now whenever the sky is clear enough. Q3: Where to look for meteors in the sky? Q4: Where to observe in Singapore? Do take note of personal safety. Observe with at least a family member or friend if you are going to a dark area. Do wear long protective clothing and deploy insect-repelling measures if you are observing in mosquito-prone areas. Q5: How frequent will Persied meteors appear in the sky? On *average* about 1 meteor per minute. Since this is just an average, it is possible not to see any for a few minutes and then a few meteors within a minute! So be patient and keep looking up! Q6: How meteors look like? Watch this excellent compilation video by Mr Y. K. Chia captured right here in the heartland of Singapore! 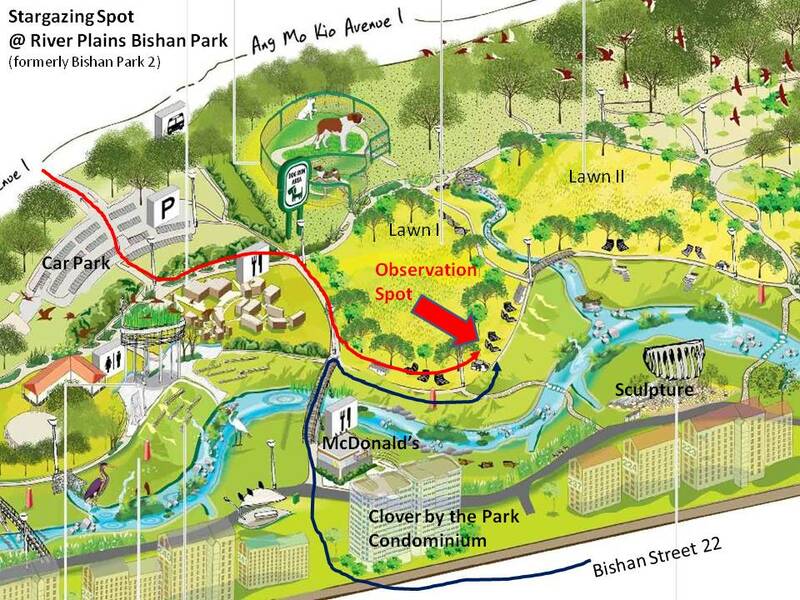 Weather permitting, from tonight 7 Aug till 11 Aug, my friends and I will bringing our telescopes and cameras to do stargazing as well as hunting/photographing meteors at Bishan Park. Either at the big lawn directly opposite McDonald's or at open grounds just outside McDonald's or both. If you happen to go to this park, feel free to drop by and say hello and observe through our telescopes at stars and planets (Venus, Saturn, Jupiter, Mars)! The hashtag for this event is #MeteorSG. Feel free to tweet your meteor hunting experience in Singapore with this hashtag so we all can share your excitement! Due to time contraint (leaving for Bishan Park soon! ), I do not have time to add more graphics and info about this event. In the next few days, I will try to update this blog. So do check it regularly! You may also search for "Perseid Meteor Shower" online (google/youtube/twitter) for more info. Wishing all of you clear skies and good luck spotting big big fireballs! 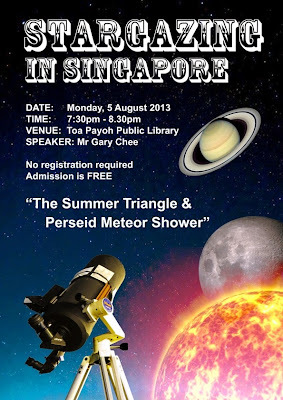 The next public stargazing talk I will be conducting is titled "The Summer Triangle & Perseid Meteor Shower". Admission is free. No pre-registration required. Late-comers also welcomed! Participants will be taught how to identify and appreciate the one of the most prominent asterism formed by 3 bright star in 3 separate constellations. A3-size printed star maps will also be distributed. The last segment of the talk will be about the upcoming Perseid Meteor Shower - the best and most anticipated meteor shower of 2013! Learn how and where to catch them right here in Singapore! Weather permitting, during/after the talk, there will be an impromptu live stargazing session at open space just outside the library. You can observe stars and Saturn through our telescopes! These public stargazing talks are usually conducted on the third Monday of each month. Due to some changes in the library schedules, only for the month of August, it will be conducted on the first Monday instead (5 Aug 2013). Sorry for my late announcement and potential inconvenience this may have caused. The latest GoLibrary publication and website do reflect the correct date of 5th of August. Since my August talk is now happening before Perseid Meteor Shower, I have decided to include this in my talk content so participants can be aware of this in advance.